In years past, creating highly ranked websites focused on creating content using tactics that appealed to search engine bots exclusively. This meant creating pages full of the strategic language computers loved that might not be engaging to your customer. Happily, the bots that search the internet are getting smarter. Search engines like Google now care about things like readability and engagement. At last, humans and bots are viewing your web pages with similar motives. 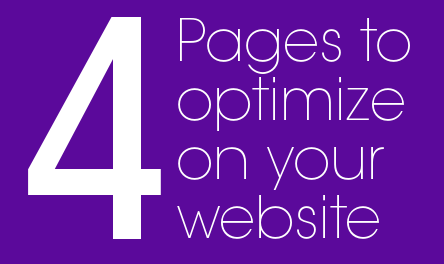 What does that mean for the four most highly trafficked pages on your website? Use the built-in styles in your Compose dropdown menus to help both bots and customers find what they're looking for fast. Both users and bots will scan headers and subheaders to quickly find information relevant to them. Make life easy for everyone by clearly organizing content for quick access. People are visiting your site because they have questions. The faster they get the answers they need, the more likely they are to have a positive experience with your brand. To help ensure that people will return to your site, put the “5 Ws” front and center. What can you do for customers? How do you deliver your service or product? Customers should never have to repeatedly drill down to find these answers, and they should certainly never have to use your contact page to learn an answer to a common question. CTAs, or calls to action, should be clearly displayed and formatted. One click should transition users from browsing to shopping in an easy, effortless, and intuitive way. Make every click pay off as much as possible. Require two clicks if it's unavoidable, and realize that if your customer has to click three times to get where they want to go, they are probably already on their way out of your site. We live in an age of technology and constant change. This means that if your website isn't updating it is literally not up to date. Bots know this. Users know this. This is why blogs aren't going anywhere. Frequently updating pages within your site, such as your blog, shows that you provide value in your business category. This not only makes bots rank you higher, but it helps you increase customer loyalty by keeping your customers educated about the marketplace. Optimizing your most trafficked pages can build the interest required to get traffic on all your pages, so take the time to look around your website to see what you’re doing right and you can be doing better. Make the necessary adjustments, then go forth and conquer. Very cool! Reminds me that I should be better about updating my site blogs.